Summer is coming! 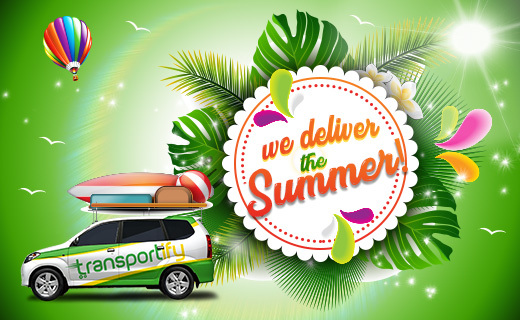 Get the best of summer fun this year by using Transportify delivery services to deliver beach items to provinces as far as Baler, or have an air conditioner delivered to your home on the same day. You know we deliver appliances. You know we deliver furniture. You know we deliver food. You know we deliver online business products. But do you know that we also deliver items for your summer pleasure? That’s right! Trasportify on demand delivery app accepts delivery requests for packages like surfboards, beach balls, swim garments, snorkels, flippers, beach lounge chairs, beach umbrellas, and salbabidas or life buoys. We can deliver any summer items you can think of—as long as it’s allowed on our platform (read more about that here)—that you, your friends, and your family might need to complete your summer trip and summer vacation. These items are not limited to beach items, of course. We also accept deliveries for summer hobby items like mountain bikes, backyard barbecue grills, and camping equipment. Of course, most families and circles of friends would consider spending the summer time out of town, away from the heat and humidity of Manila. If you need your summer stuff delivered to a certain vacation spot in the provinces, you will be glad to know that our service area coverage is expanding continuously to reach more clients. Just recently, Transportify freight logistics company made a surfboard delivery as far as Baler, Aurora Province. As part of our goal to revolutionize the logistics industry in the whole country, we are slowly making our way past the metro and towards the provinces. So if you need to make a customized provincial delivery but you are not sure if it is within our expanding service area, just contact our customer service representative. Well, not everyone will be island hopping and mountain hiking this summer. Some people prefer having a staycation or enjoying the summer in the comforts of their own home, with avoiding the heat as the only concern. Thus, summer became the time of year when people often buy air conditioners, electric and industrial fans, and air coolers from appliance centers. Make your summer even cooler by booking with Transportify pick up and deliver courier to get the cooling appliances you need straight to your home after you purchased them. Are you ready for summer? Transportify is! Contact us for questions about our summer deliveries and our customer service representative would gladly assist you. Let Transportify, Manila’s smartest logistics support app, make your summer better, brighter, and ten times happier! Deliver summer necessities like surfboards, reach far provinces like Baler, Aurora, and make summer staycations cooler with same-day air con and fan deliveries.